Revenue in the Sauces & Condiments segment amounts to £33,167m in 2019. The market is expected to grow annually by 1.3% (CAGR 2019-2023). In global comparison, most revenue is generated in United States (£33,167m in 2019). In relation to total population figures, per person revenues of £100.78 are generated in 2019. The average per capita consumption stands at 31.1 kg in 2019. Reading Support Revenue in the Sauces & Condiments segment amounts to £33,167m in 2019. Reading Support The Sauces & Condiments segment is expected to show a revenue growth of 1.5% in 2020. Reading Support The average revenue per person in the market for Sauces & Condiments amounts to £100.78 in 2019. Reading Support In the market for Sauces & Condiments, volume is expected to amount to 10,123.7 mkg by 2023. 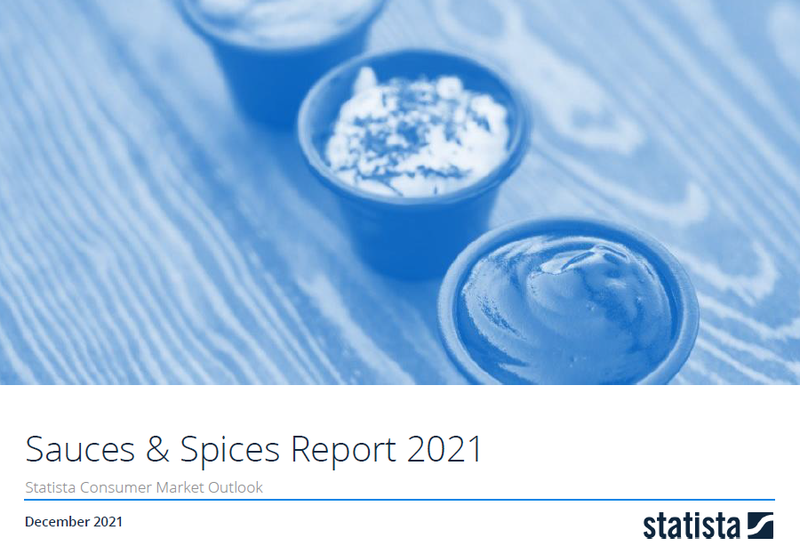 Reading Support The market for Sauces & Condiments is expected to show a volume growth of -0.7% in 2020. Reading Support The average volume per person in the market for Sauces & Condiments amounts to 31.1 kg in 2019. Reading Support The average price per unit in the market for Sauces & Condiments amounts to £3.24 in 2019. Reading Support With a market volume of £33,167m in 2019, most revenue is generated in United States.